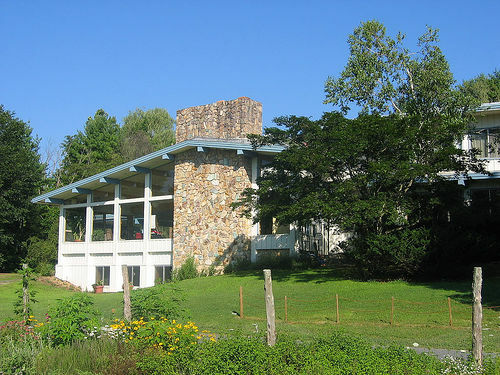 In August of 2002 I went for the first time to Elat Chayyim, the Jewish Renewal retreat center which was then located in Accord, New York. (It has since become the Elat Chayyim Center for Jewish Spirituality at Isabella Freedman Jewish Retreat Center, but my first visit was many years before that change happened.) That week-long retreat was my first taste of Jewish Renewal outside of books. A first big step on what I didn’t yet know was my life’s path. On the Jewish calendar, that first retreat included the first day of Elul. That’s when I learned the melody for psalm 27, Achat Sha’alti, which I still pray and sing and teach today. This year, we’re about two weeks short of that Jewish anniversary. But on the Gregorian calendar, that first retreat began ten years ago today. The anniversary gives me a good excuse to remember that first retreat, and to reflect on these ten years I’ve been blessed to spend in Jewish Renewal community. 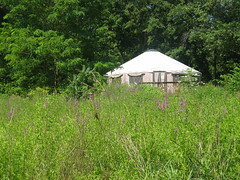 The white yurt, where we davened on weekday mornings. So much! Interpretive shacharit with Phyllis. Chants, prayers, intentions. What they really mean. Cold air, sun, one man and maybe 12 women. Seeing the face of God in all our faces at bar’chu. En route to lunch I found myself amused by this notion: sure, if I could spend the first six hours of every day davening, meditating, and practicing yoga, of course I’d be this bright and serene all the time! Shacharit was really gorgeous. All easy chants, easy to learn. (As we bless the source of life, so we are blessed…) I especially liked the interpretation of “ashrei yoshvei veitecha, od y’hallelucha selah” — lit. “happy are those who live in your house, they will praise You always,” but Phyllis talked about the houses we carry with us — our bodies — and how liberating it is to become happy in that house. That first Jewish Renewal weekday morning service — I chose the “interpretive” morning service, rather than the “traditional” one — had a profound imapct on me. I remember sitting in a circle on the floor of the white yurt. I remember my first sight of women laying tefillin, and how the idea both startled and attracted me. And that teaching which Reb Phyllis offered — her interpretation of the ashrei, the idea of becoming happy in our own bodies and praising the One out of that sense of grateful embodiment — is one I still offer sometimes when I lead morning services. Reb Nachman practice: walking in field talking out loud w/ God. Breakthrough experience. Was talking about this week, how I want to take this awareness with me — and wound up weeping, wrapped in my tallit, because I understood that God is always with me. Even when I feel most alone. It was staggering. I can’t entirely explain it. During that first week-long retreat at Elat Chayyim, I spent my mornings studying Jewish meditation with Rabbi Jeff Roth, and my afternoons studying tikkun olam with Rabbi Arthur Waskow. 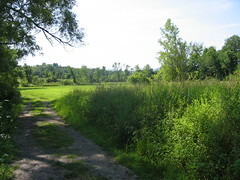 On Friday morning, the culmination of our weekday learning, Reb Jeff gave us the practice of walking in the fields, speaking aloud with God quietly. I remember telling God how glad I was that we were finally on speaking terms again. (That’s a story which doesn’t really bear exploration at this juncture; the short version is, I’d been feeling estranged from God for a while.) I remember saying that I was sorry I couldn’t bring God home with me. And I remember realizing, in a flash of insight as sudden as any lightning bolt, that God would be coming home with me; that God had been with me all along. Even in the moments when I had felt most distant from God, God had been with me. Is it corny to say that that moment changed my life? Services at the old Elat Chayyim. Photo credit: Elat Chayyim. As we sang mah norah hamakom hazeh (“how awesome is this place”) I found myself weeping. All the voice parts, and the feeling! Also remarkable was the 84-year-old woman who, since we were using a mini-sefer Torah, got to do hagbahah and lift it overhead. She wept and so did I. My first Jewish Renewal Shabbat, davening beneath the white tent which was open, like the tent of Abraham, on all four sides. On Friday night, Reb Jeff led services, all in white with a brocade vest for ornamentation. He played guitar and he sang and the service was beautiful. And on Saturday morning, the service was led by Rabbi Andrea Cohen-Kiener. The three-part melody she taught us for Mah norah hamakom hazeh is still one of my melodic touchstones, something to which I return when I need to feel connected. And I remember the joy on the face of the woman who, at eighty-four, was able for the first time to perform the mitzvah of lifting our Torah scroll into the air for all to see. Her husband had died some years before, and she told us she could feel his presence with us as she held the scroll aloft. I think most of us were weeping happy tears by the time that part of the service was over. By the end I felt…opened. Awed. Transported. …I think this is what they mean by ecstatic prayer. That I can gain access to that joy — I, with all my unOrthodoxies — is overwhelming. Opened. Awed. Transported. I hadn’t known, then, that prayer could be like that. That service cracked my heart open, and all of my yearning for God and yearning for community and yearning for connection came pouring out — and something ineffable poured back in. Ten years. Could I have imagined, then, who and where I would be now? Thank you, Elat Chayyim. Thank you, Reb Jeff and Reb Arthur and Reb Phyllis and Reb Andrea — and everyone with whom I have learned and davened in the ten years since. Thank you to everyone in Jewish Renewal who has been a part of this extraordinary journey. I am grateful beyond words. Thanks for reprinting this! What a beautiful new blog; I’ll add it to my aggregator and my blogroll right now. Todah rabbah! We are happy to reprint this for our Jewish Renewal audience!